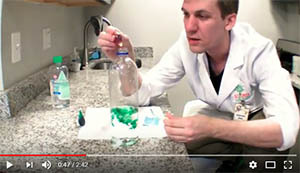 Watch Scientist Joe as he makes the Lava Lamp Experiment here! Add a few drops of your favorite food coloring. Watch as the color sinks through the oil. Did your drops of color mix with the water immediately or float in between for a few minutes? The oil floats on top of the water because it is less dense or lighter than water. The food coloring has the same density as the water so it sink through the oil and mixes with the water. When you add the tablet it sinks to the bottom then starts to dissolve. As it dissolves it makes gas, carbon dioxide. Gas or air, is lighter than water so it floats to the top. The air bubbles bring some colored water with them to the top. When the air comes out of the colored water blob, the water gets heavy again and sinks. It does this over and over again until the tablet is completely dissolved.